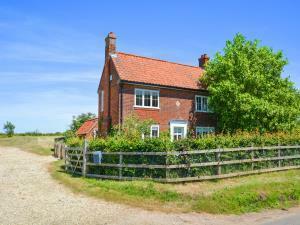 County Farm01263 715779work01603 870304fax Self-cateringIf you are looking for a perfect place to stay to get away from it all then this is definitely the property for you! Set within open countryside with rural surroundings,this former farmhouse stands just outside of the quiet village of Hindringham which is only a stones throw to the stunning North Norfolk coastline and popular Georgian town of Holt. The owners have recently refurbished the accommodation to provide stylish living with all the creature comforts required for an enjoyable family stay. The area is adorned with country lanes and footpaths to walk your four legged friend. For those who enjoy a traditional day at the seaside you are spoilt for choice - the beaches at Wells-next-the-Sea, Cromer and Sheringham are all within a short car journey and each offer the perfect spot to build sandcastles and enjoy an ice cream or two! Train lovers can visit the Wells to Walsingham Light Railway, or journey on a diesel or steam train on the Poppy Line from Holt to Sheringham. There are a vast range of good restaurants and pubs within this stretch of coastline where you are sure to be able to try local delicacies such as crab and samphire in the summer months. Whatever you choose to do, County Farm has a warm and welcoming atmosphere so you can switch off and unwind at the end of a lovely days exploring. • Notes: Non smoking property. Barns and farm buildings sit alongside this property, these are not for guests use. There is an uncovered pond in the grounds of this property - children should be supervised at all times. If you are looking for a perfect place to stay to get away from it all then this is definitely the property for you! Set within open countryside with rural surroundings,this former farmhouse stands just outside of the quiet village of Hindringham which is only a stones throw to the stunning North Norfolk coastline and popular Georgian town of Holt. The owners have recently refurbished the accommodation to provide stylish living with all the creature comforts required for an enjoyable family stay. The area is adorned with country lanes and footpaths to walk your four legged friend. For those who enjoy a traditional day at the seaside you are spoilt for choice - the beaches at Wells-next-the-Sea, Cromer and Sheringham are all within a short car journey and each offer the perfect spot to build sandcastles and enjoy an ice cream or two! Train lovers can visit the Wells to Walsingham Light Railway, or journey on a diesel or steam train on the Poppy Line from Holt to Sheringham. There are a vast range of good restaurants and pubs within this stretch of coastline where you are sure to be able to try local delicacies such as crab and samphire in the summer months. Whatever you choose to do, County Farm has a warm and welcoming atmosphere so you can switch off and unwind at the end of a lovely days exploring.